THE KRAKEN is a baroque gathering of international gamers, gamemasters and game creators to play, develop and test fine quality games. Taking place at the Prussian Château Schloss Neuhausen and combining high comfort, all-inclusive fine food and drinks (including German beer of course), a picturesque venue and the best in gaming makes THE KRAKEN a pearl of a gaming event. 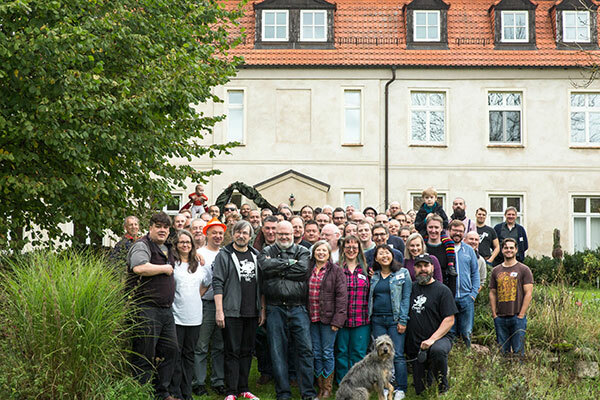 THE KRAKEN is up to five days of games and fun spent in autumn at a wonderful Château in former Prussia, Germany. Great cuisine, exquisite drinks, comfortable rooms, stunning gaming events and a marvelous venue make THE KRAKEN a game fest extraordinaire. THE KRAKEN is an international gaming event with time for both fantastic games and having a relaxing time with fun people. The main language at THE KRAKEN is English. Its auspicious timing now places THE KRAKEN on the weekend before Essen SPIEL — making it a natural warm-up event for some of the greatest luminaries of gaming. THE KRAKEN is the official successor to the Tentacles Convention and is hosted by the RuneQuest-Gesellschaft e.V. It honors the tradition of supporting the classic games and gameworlds of Chaosium, Inc., Moon Design, Petersen Games, Pegasus Spiele, The Design Mechanism, and Éditions Sans Détour but is open to all kinds of quality games and gamers. THE KRAKEN is also the heir to the crazy, fun and innovative spirit of Tentacles being run by the same team and hosting many of its former attendees and guests. THE KRAKEN is a non-profit event. Yes, even the organizers pay for their stay.